What sounds instantly come to mind when your mind wanders over summer? 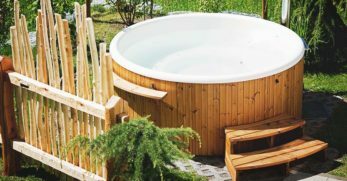 For me, it’s birds chirping, dogs barking, horses whinnying, and wind chimes clanging in the breeze. Wind chimes are one of my favorite sounds. I love how beautifully decorated most wind chimes are, and I love the feeling of home they bring with them. I love them to the point I have them hanging on the front porch of my chicken coop. But wind chimes are also wonderful because they can be made from scratch using upcycled materials and can be used as fascinating gifts too. 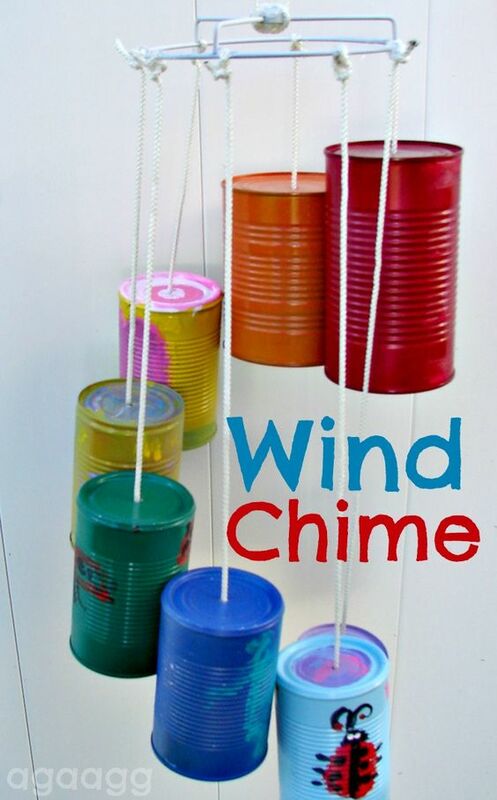 Do you have small children who would get a kick out of creating a wind chime? Well, this could be the wind chime for you. 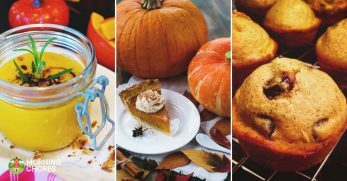 You’ll need a paper cup, beads, and a few other items. Follow the tutorial, and you can have an adorable wind chime in no time flat. These wind chimes look fun and festive. Most kids would enjoy looking at and making them too. If you’re looking for a fun way to keep your kiddos busy this summer, try this. 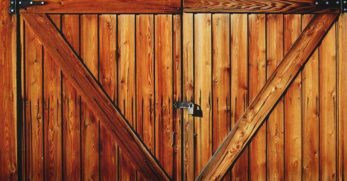 You’ll need some tin cans, paint, and a few other miscellaneous items to complete these chimes. 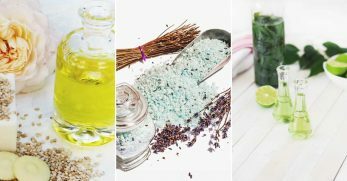 Follow the tutorial and have beautiful and creative wind chimes to enjoy during the summer months. This is a wind chime project for adults. You can upcycle old wine bottles by following this simple tutorial and turning them into gorgeous wind chimes. If you’re nervous about cutting glass bottles, hopefully the tutorial will put your mind at ease. 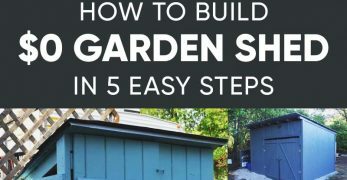 It’s very thorough and has pictures to help you visualize what you’re doing throughout the process. Do you have a bunch of old keys taking up room on your keychains? Don’t leave them hanging any longer. Instead, turn them into a unique wind chime. 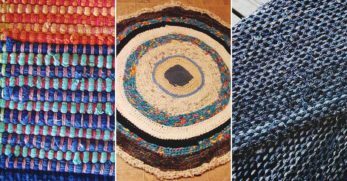 The tutorial will show you how to make each section and end up with a beautiful masterpiece to add charm to your home or give away as the perfect gift. Bamboo wind chimes are some of my favorites to choose from because of the unique sound they make when clanging together. But I also love their soft appearance too. If you have access to bamboo, you should check out this tutorial and get to work on creating these beautiful chimes. Do you live in an apartment or another living arrangement where you don’t have an ideal location to hang wind chimes? 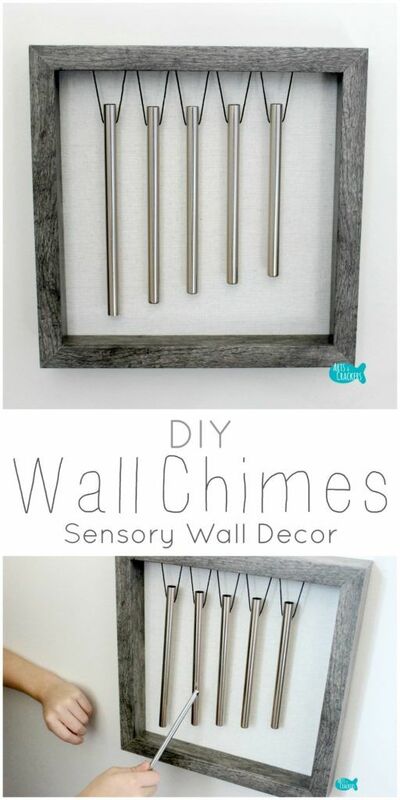 Well, try making these wall chimes. They’re easy to make, look gorgeous, and will give you the same delightful sound. This wind chime is one of my favorite options on this list. You keep the strainer right side up and hang the chimes below it. However, the fun doesn’t stop there. 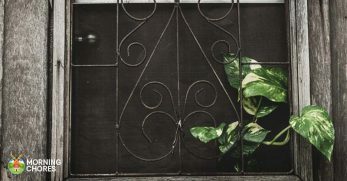 You plant flowers in the top of the strainer which adds to the décor of your home. Do you have an old coffee can cluttering up space? What about old CDs you rarely listen to anymore? If you answered yes to these questions, this is the perfect wind chime for you. 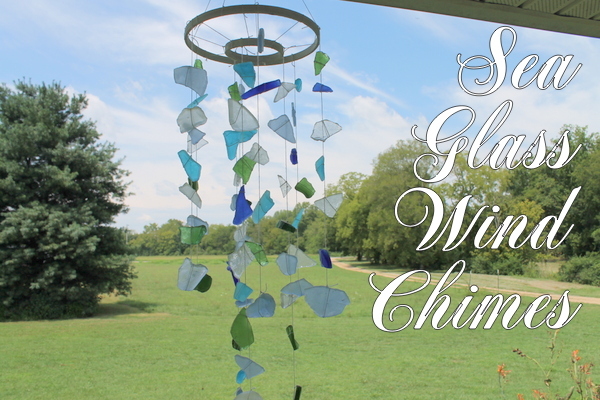 Be sure to follow the tutorial when putting the wind chime together. However, you can make it as colorful or as basic as you wish. Miniature terracotta pots are rather inexpensive in most store locations. 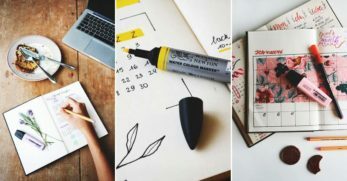 If you come across a deal on those, this could be a wonderful project for them. 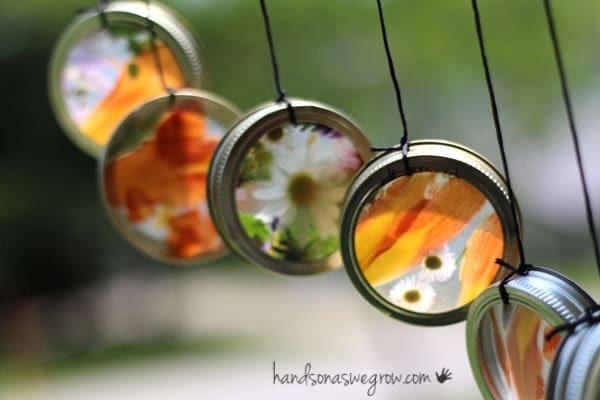 The tutorial will walk you through how to connect each pot to the base, but with a little paint, you could have a beautiful and inexpensive wind chime. 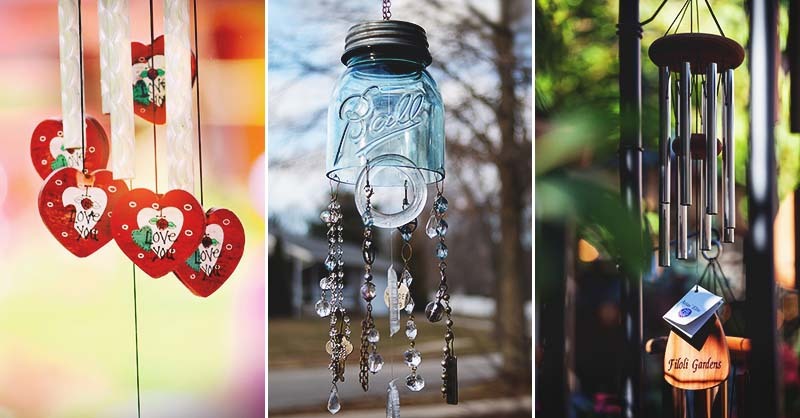 Are you looking for a wind chime to hang on your porch which will add charm and a little color too? This could be the wind chime for you. 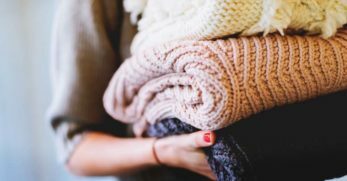 You’ll need a few items from your local big box store’s craft department. 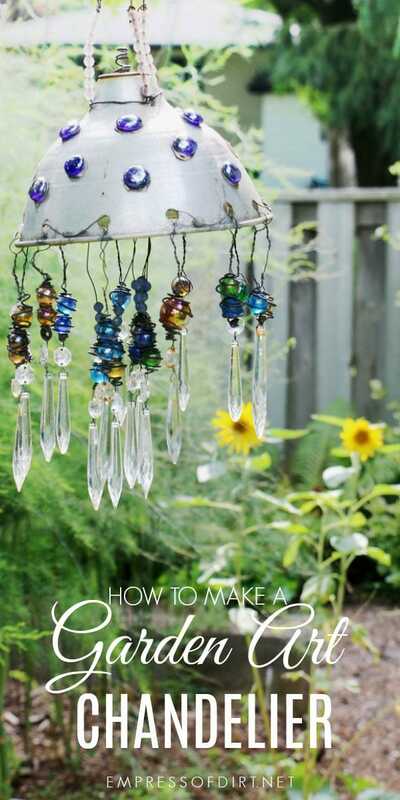 When you have the supplies required, follow the tutorial to create this beautiful wind chime. Are you looking for a way to upcycle old bullet casings? Maybe you want a more rustic wind chime for decoration? Well, either way, this is the wind chime for you. You’ll need a canning ring, some string, and old bullet casings. Attach the casings to the string and attach the string to the canning ring. From there, you have an upcycled and unique wind chime. When I go to the beach, I love to collect seashells. I love their vast differences in shapes and colors. They’re simply gorgeous. But I run into the problem of what to do with the seashells I collect. This could be an excellent solution. They could be turned into a functional wind chime which I could enjoy every day. Do you have an old sifter you don’t use for much anymore? Don’t toss it in the garbage before you see this tutorial. The sifter is the base of the wind chime. From there, old measuring spoons are attached for a unique vintage look. In my younger days, I remember when it was all the rage for people to make and wear bottlecap jewelry. 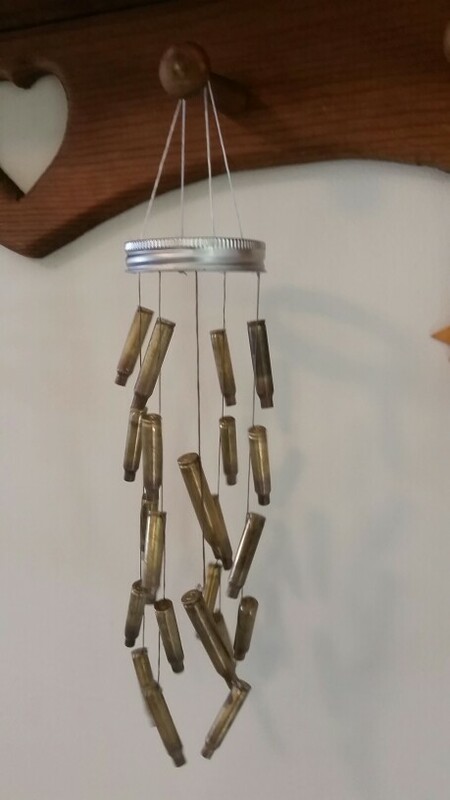 Well, if you still have any old bottle caps hanging around, they can now be repurposed into a unique wind chime. No two will ever look the same and what a great way to decorate your home inexpensively. There’s nothing quite like holding a vintage biscuit cutter in your hands. I know there was a time when ladies gave their biscuit cutters quite the workout. I appreciate the effort past generations put into their daily routines. 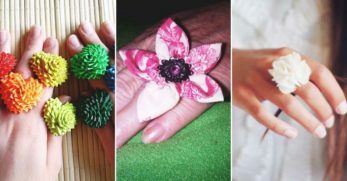 Whether you would like to hold on to a piece of yesterday, or you simply like biscuit cutters because they look cool, they can be used to make nice wind chimes which will make your house feel more like a home. 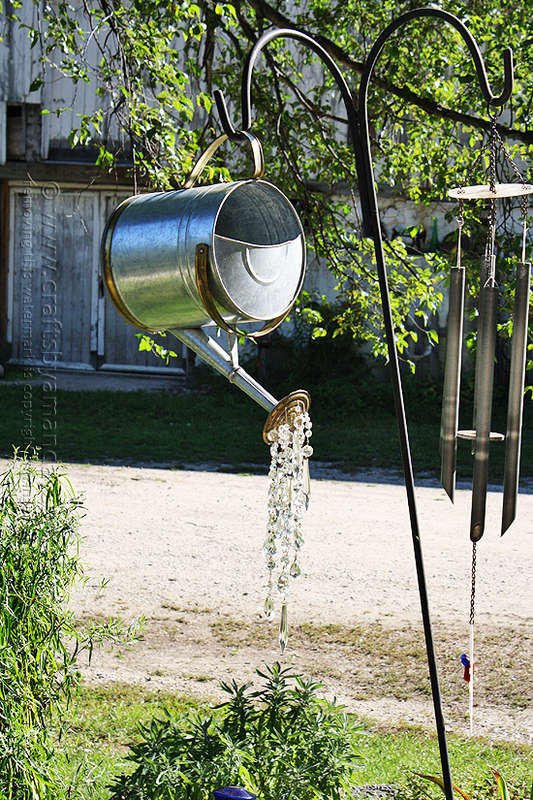 This wind chime would be more for looks and less for sound, but could you imagine a better way to add some pizazz to your garden? All you need to do is attach the crystals to the watering can and hang the watering can in your garden to where it looks like they’re being poured out. Do you have an unused teapot hanging around your house? Have you recently come across a vintage teapot you’d like to somehow incorporate into your home décor? Well, this wind chime could be for you. The tutorial shows you how to use the teapot as the base for the wind chime and hang utensils or teacups under it for a gorgeous look. 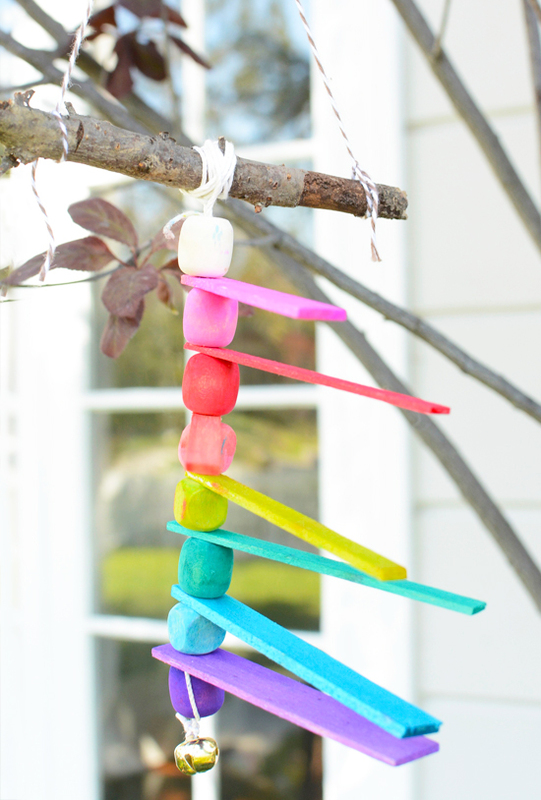 If you’re looking for a fun activity for the kiddos, this wind chime could be exactly what you need. 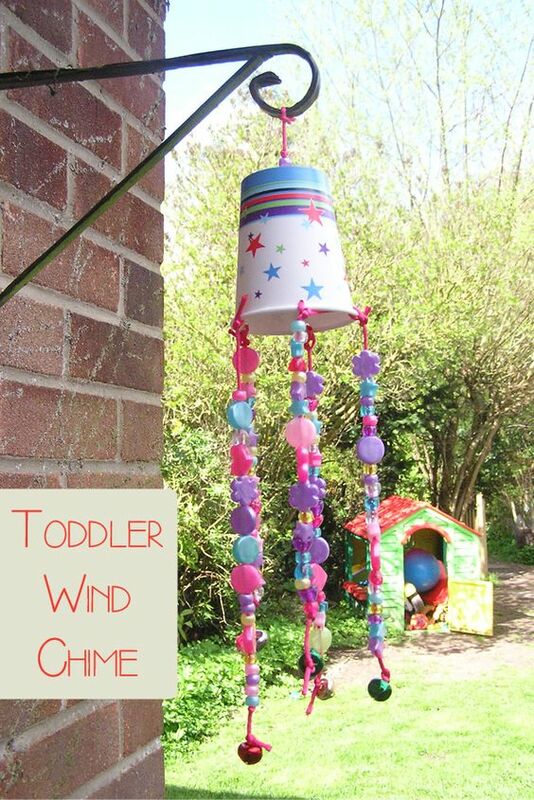 You could also make this wind chime for a small child and gift it to them. Either way, this wind chime transforms a clay pot into a jellyfish. 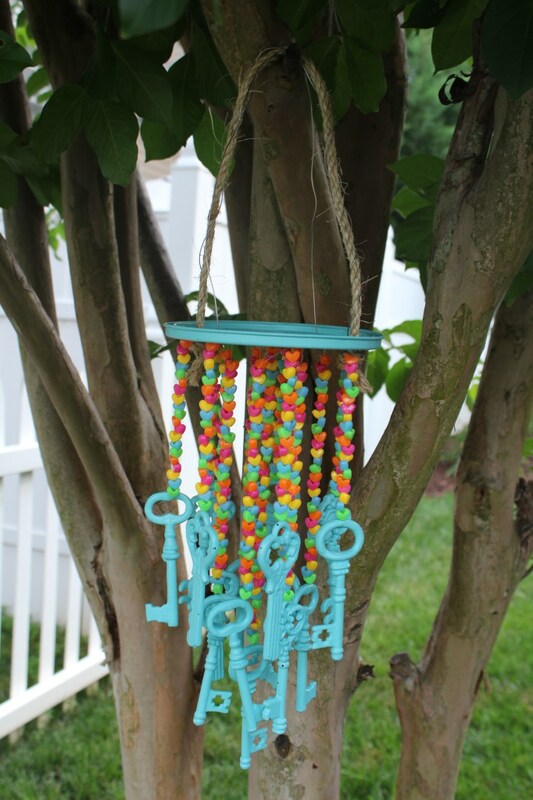 Beads and other items are added to the bottom to finish the wind chime look. This is a fun idea and would be a perfect gift for someone who loves owls. 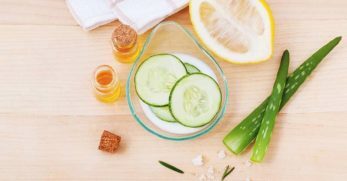 You use a cheese grater and add lids to make eyeballs for the owl. 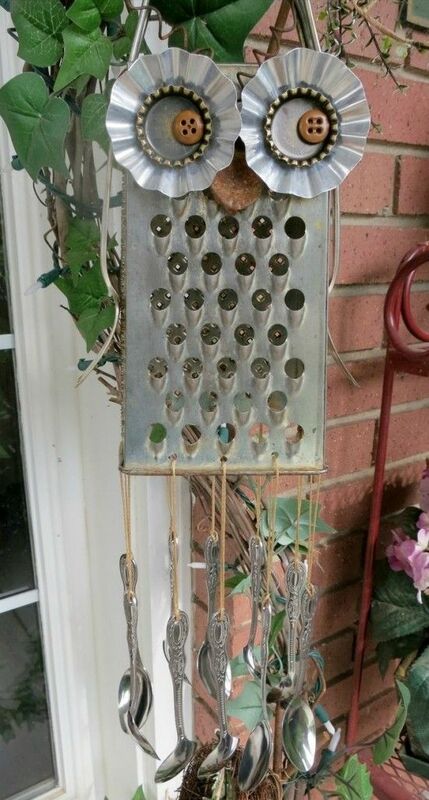 Once done, you attach utensils under the cheese grater to finish the wind chime look. 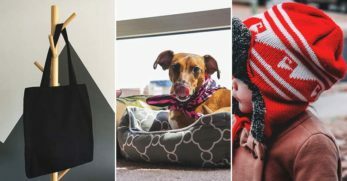 It will certainly catch the eyes of any visitors you have around because it’s adorable. With the speed technology moves, old hard drives and other computer parts are everywhere and can make remarkable up-cycled items. Hard drives especially make an interesting sound when clanging together, while the shiny side reflects the sunshine in beautiful splashes on your floor and wall. You can use this tutorial to transform them into unique wind chimes which will draw a great deal of attention to wherever they’re hung. 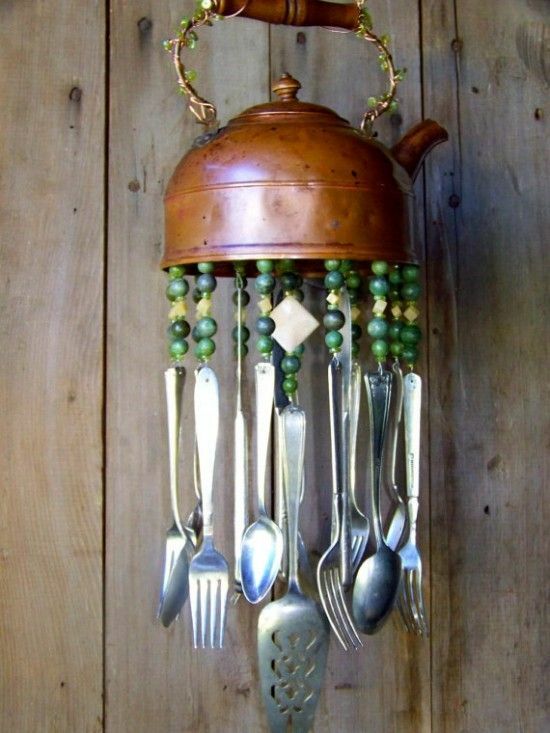 If you have old utensils, bells, serving platters, or anything else you don’t use anymore but hate to part with, consider turning them into wind chimes. 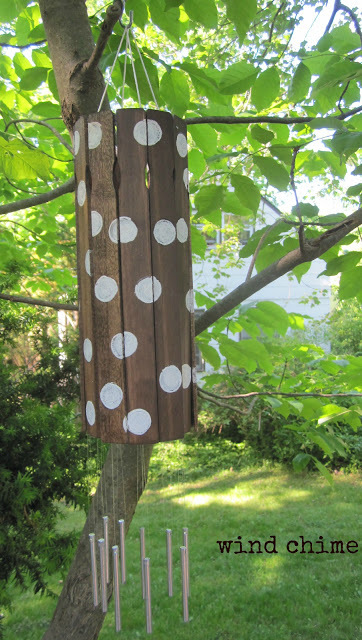 This site offers a great many ideas on how to upcycle items into wind chimes. 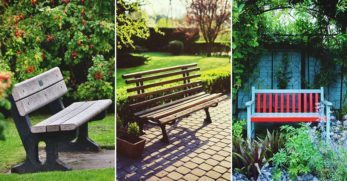 They’re gorgeous and certainly become eye-catching pieces of décor. 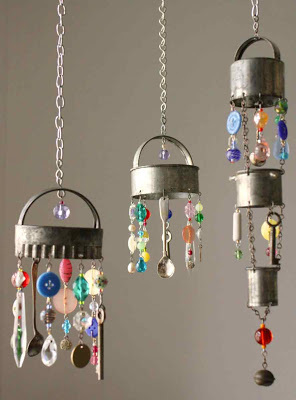 This wind chime is one which is appealing to the eye, can be made as colorful or subdued as you prefer, would be a great project with the kids, and should be cost-effective. You need a piece of driftwood which you can attach some string to. The string should have the washers hanging from it. Each creation will be unique to the maker and should give a boost of décor to any place where this wind chime hangs. 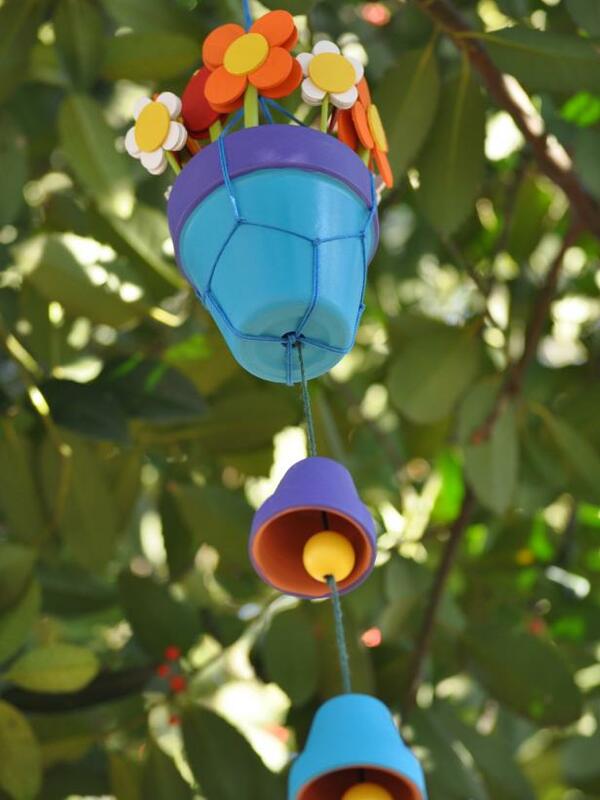 These wind chimes look bright and festive which should make them suitable for any time of year. But they would be an excellent way to keep the kids busy during cooler fall days. 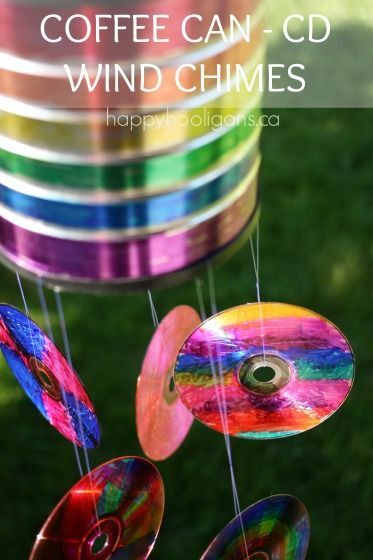 Either way, you need only a few basic ingredients to make these unique and colorful wind chimes. What a great way to brighten up your home and make memories simultaneously. 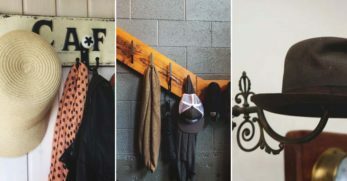 It should be no surprise I’m a huge fan of upcycling and country charm. I love these wind chimes because it incorporates both. If you have old spindles going unused, check out this project. 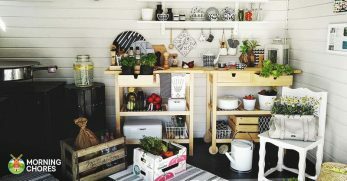 It’s a great way to add simple charm to your home while using unwanted items. Are you looking for a more modern and simplistic wind chime to decorate your home with? These wind chimes could be precisely what you need. The design is Japanese inspired and very simple. It’s glass with a wooden ball hanging inside. It would be perfect for most modern décor. 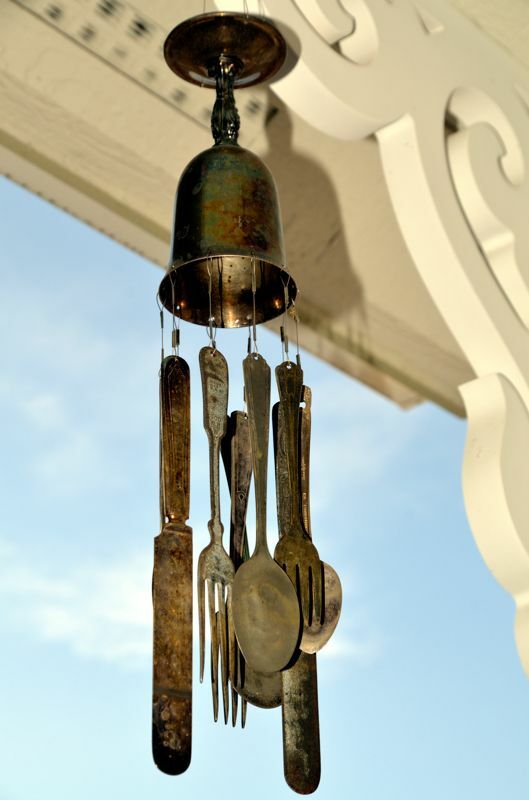 This wind chime would be a great addition to any home. 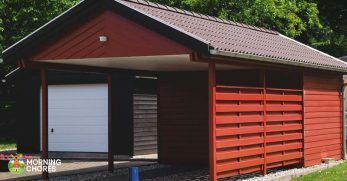 You can find most of the materials needed at your local hardware store. 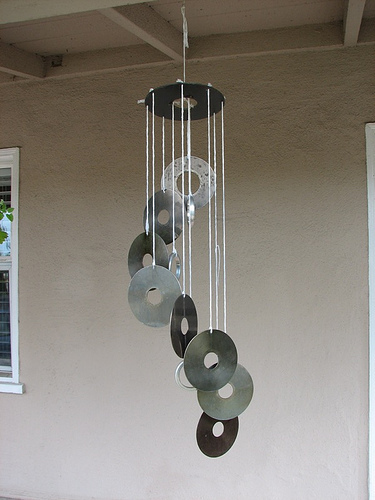 If you’d like to have a metal wind chime with a more abstract appearance, this wind chime could be just what you need. When my kids were little, they loved their toy xylophone. They’d bang on it until I wasn’t sure they’d be able to bang on it anymore. Do you have one of these toy xylophones your kids are no longer using? Well, you can use it to make a unique and musical wind chime. 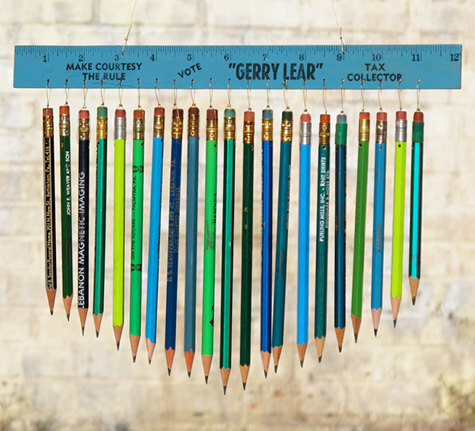 Obviously, these pencil chimes aren’t going to work the same way a regular wind chime would. But they would be great for décor. All you need is some pencils, string, and a ruler. They would make the perfect gift for a favorite teacher or principal. This wind chime is a little more involved than some of the other wind chimes mentioned above. 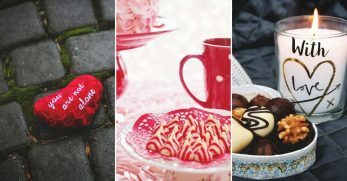 You have to mold the candy hearts into shape. 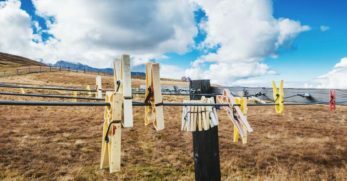 From there, they’re hung by ribbon and attached to a piece of wood. 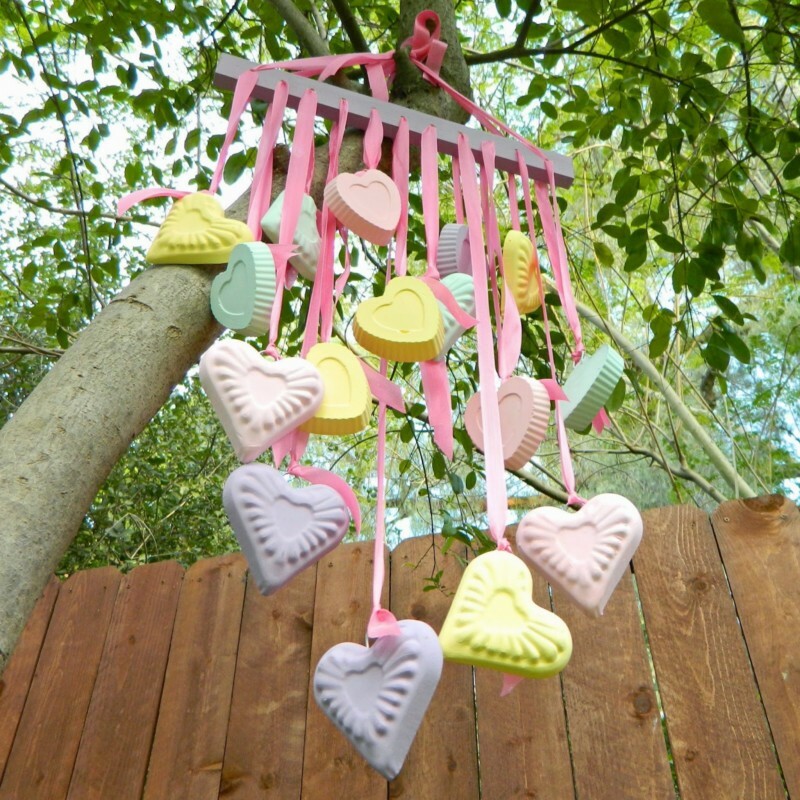 The candy hearts wind chime would be a great way to decorate your home for Valentine’s Day. 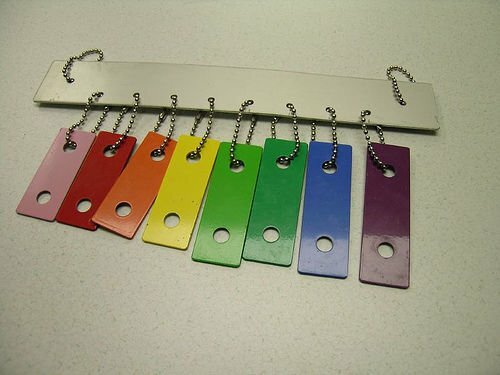 Paint sticks are usually given away for free at most hardware or big box locations. If you must pay for them, they don’t usually cost very much. 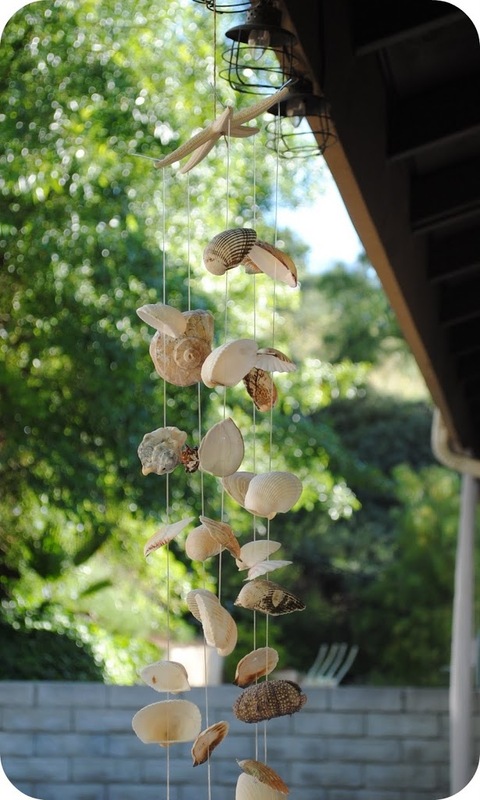 With this in mind, this wind chime is not only adorable to look at, easy to construct, but also very budget-friendly. 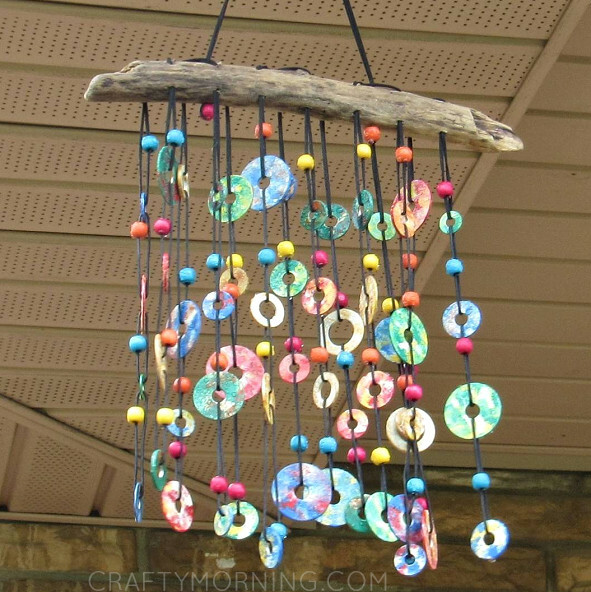 If you need a cute idea for a wind chime which won’t break the bank, check this one out. Have you come across vintage silverware for a great price? Feeling unsure of what to do with it, but you want it badly because it looks cool? 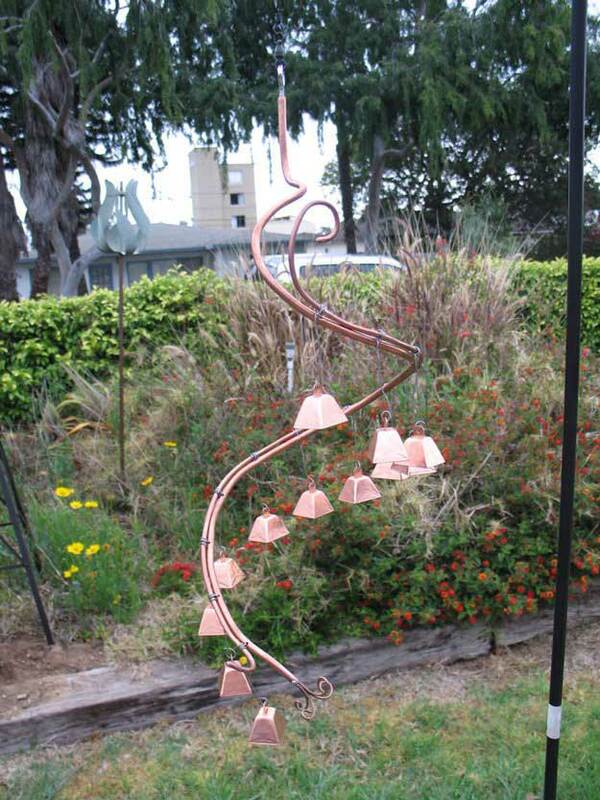 Well, you’ll be glad to come across this wind chime idea. 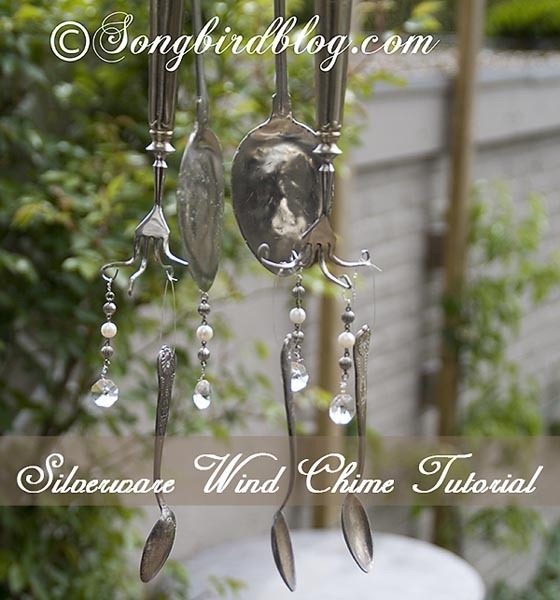 It shows you how to use vintage silverware to construct a wind chime. It looks great and is a great way to use old silverware which no longer has a match. Do you and your kids enjoy getting outside and collecting flowers? Do you bring them in and press them for later use? Well, this wind chime could be a great way to use those pressed flowers. 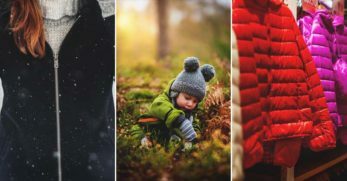 It’s a great way to put nature on display and decorate your home with it. Most wind chimes are basic little chimes hanging from a string. Well, whatever you thought you knew about a wind chime should be tossed out the window at this point. Now, make room for the garden chandelier. It’s a unique piece of art used to upcycle old items (such as an old heat lamp) and has crystals hanging from it for a touch of glam. Well, you now have 33 options for DIY wind chimes. 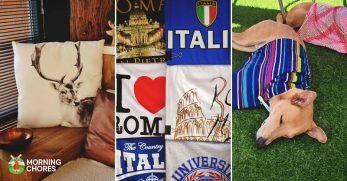 They’re gorgeous and creative ways to decorate your home and add a little more charm. 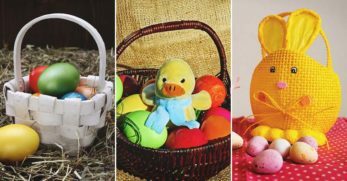 But they’re also a great way to be creative with your kids and make a tangible item to help remember those fun times. Whatever your reason for making wind chimes, we hope you find one here which is precisely what you’ve been looking for.